Eric Nystrom knew all he had to do was keep his stick on the ice. The puck was coming from his buddy, David Moss. He just needed to tip it. Which is exactly what happened as the rookie scored his first goal in the National Hockey League Tuesday. 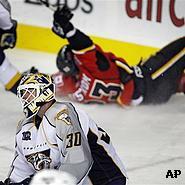 Nashville Predators' goalie Chris Mason, left, looks away as Calgary Flames' Eric Nystrom celebrates his first NHL goal during third period NHL hockey action in Calgary,Tuesday, Oct. 30, 2007. "It's awesome. Once we had the two-on-one, I knew the play. That's a play we had used a lot in the minors. I knew, going to the net, I just had to put my stick down and Mosser was going to find it. He put it right on my tape. The net was wide open so I just tapped it in," said Nystrom, whose Flames went on to defeat the Nashville Predators 5-1. It was just Nystrom's second NHL game this season and the fourth of his career. He missed much of last season with a shoulder injury. Sent to the minors during the Flames training camp, Nystrom knew he was playing catch-up after missing so much time. "It's tough to come back and play at this pace after missing so much time. I went down to the minors, worked hard, did what I was told and here I am," said an excited Nystrom. His first call-up this season was for a recent game against San Jose, won by the Sharks 4-1. Nystrom saw a little more than fur minutes of ice time. Against the Predators he saw abut 14 minutes of ice time and, in the third period just before his goal, he blocked three shots on a penalty kill. The tip-in goal was like a reward for falling in front of pucks. "I've wanted to do that my whole life," he said of scoring in the NHL. "I just went to the net and Mosser made a great play." Nystrom remembers the overtime goal his father, Bob, scored in 1980 to bring the New York Islanders their first Stanley Cup. "This was a little different. He had a backhand re-direct. And he stayed on his feet," smiled Nystrom. After he scored Tuesday, Nystrom slipped and slid behind the Predators net before the celebration began. Moss, a teammate of Nystrom's with the Michigan Wolverines and a line mate in the Flames farm system for a couple of seasons, was there right away. "I was probably more excited than him," laughed Moss. "I said in the pile to him 'Nobody better than you to set me up'," added Nystrom. Nystrom's goal was the Flames fourth of the evening and provided a cushion for the Flames, who were feeling a little heat from a desperate Nashville team in the third period. "It's nice to get a win like that. It's nice to be able to set him up. I just tried to find a hole and slide it through to him," said Moss. In the celebration the traditional retrieval of the puck was forgotten. "It was out there for about two and a half minutes," said Nystrom. "I was just happy it didn't get flipped out of play." The puck was eventually covered by Calgary goalie Miikka Kiprusoff and Craig Conroy alertly collected the souvenir for Nystrom. Not lost in the post-game activities was a pie in the face for Nystrom while he was being interviewed on television about his first NHL goal. Teammate Eric Godard delivered the pie perfectly. "Right in the face. On television. I didn't feel it," laughed Nystrom.